I'm sure I'm not the only one who's forever trying to plug in a USB cable only to find it upside down. And then I flip it and try it the other way, and that doesn't work either, so I go back to the first side, until I finally get it plugged in, because there's no easy way to tell visually which way the plug is supposed to go. It's true of nearly all of the umpteen variants of USB plug: almost all of them differ only subtly from the top side to the bottom. In an art store a few weeks ago, Dave had a good idea. He bought a white paint marker, and we've used it to paint the logo side of all our USB cables. Tape the cables down on the desk -- so they don't flop around while the paint is drying -- and apply a few dabs of white paint to the logo area of each connector. If you're careful you might be able to fill in the lowered part so the raised USB symbol stays black; or to paint only the raised USB part. 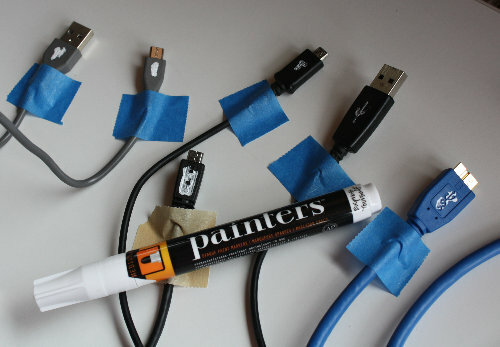 I tried that on a few cables, but after the fifth or so cable I stopped worrying about whether I was ending up with a pretty USB symbol and just started dabbing paint wherever was handy. The paint really does make a big difference. It's much easier now to plug in USB cables, especially micro USB, and I never go through that "flip it over several times" dance any more.